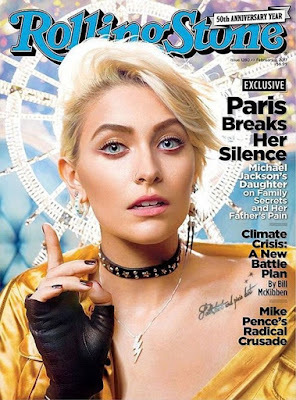 Wendy Williams has thrown some subtle shade at Paris Jackson after she graced the latest cover of Rolling Stone magazine. Paris told the magazine that she believes her famous father was murdered and also said she "considers herself black" because that's what her late father told her. "What do you really think about that though?" the TV host asked her audience on Wednesday, "But can we talk? She has not made her mark on her own. You can't be on the cover of one of the most prestigious magazines in the world and just be the daughter of [Michael] and tell your story inside. She hasn’t made any music that we know of, she’s done the modeling but she’s not on her way." Wendy said she would have preferred a picture of Michael on the front, but still have Paris' interview inside. "I think it would be better if it came out at the time of her dad’s anniversary in June and put a great picture of Michael on the front and then on the inside have Paris doing all the talking because her talk is good." "She thinks her dad was murdered. We have heard this before - when the stakes get high and insurance things are paid. I am not surprised that she said that she feels like her father was murdered. She goes on to say the rest of the family feel the same way. So she is not alone in this though. And she’s hoping that justice will serve one day." Wendy then addressed Paris' comments about considering herself black. "By the way, she considers herself black period and she said she’s not going to address this anymore. Her father constantly reminded her of being black and proud." "At the end of the day, I think it’s terrific because this is the first time in about a year a black woman has been on the cover of Rolling Stone magazine. I get that she considers herself black… black is not what you call yourself - it's what the cops see when they’ve got steel to your neck on a turnpike. But that’s cute. Good for you Paris."